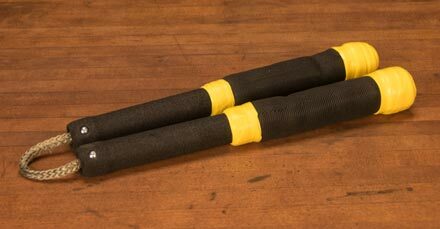 Introducing our new Dark Monk studio / practice nunchaku. They are balanced for speed and toss styles. These have a unique two part grip that includes a thinner foam padding near the cord to increase move accuracy and a padded end to both add tip weight and protect the artist while mastering new skills. The cord is Technora and can be adjusted or replace by removing either end cap and re-tieing the knots inside. For added saftey, the top grip extends over the cap, to help protect the artist hands from pinching. Choose a custom silicone color to personalize your chucks. We are extremely proud and humbled that these are now the official practice chucks of Ken Hill and FlowTricks.net. Ken was a critical part of the design process and we can not thank him enough.